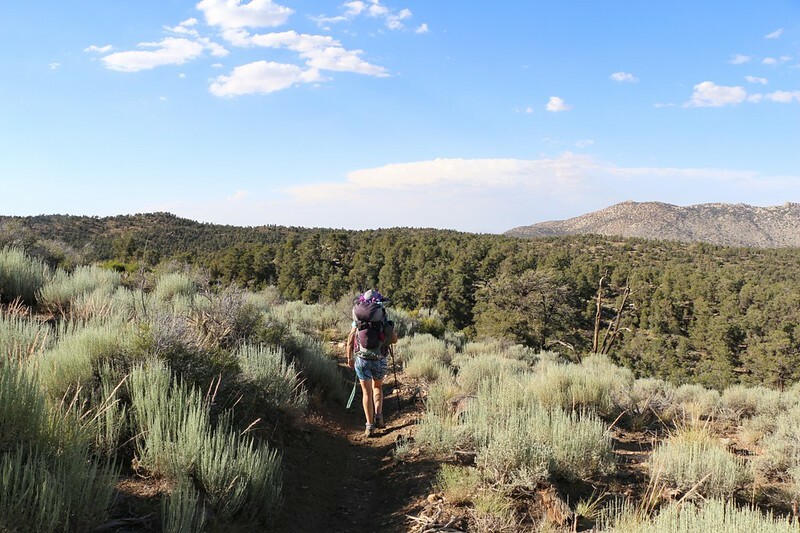 We decided to hike yet another section of the Pacific Crest Trail (PCT) over the Fourth of July Weekend. 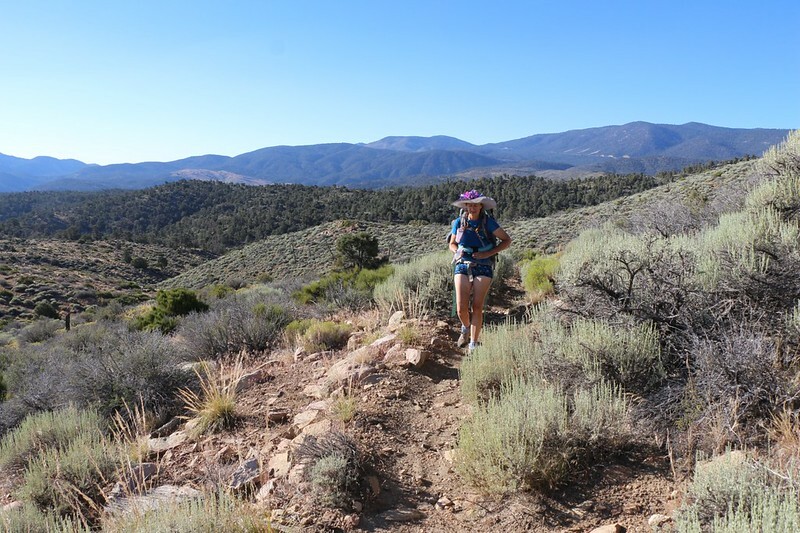 This time, our plan was to hike the section just north of the San Gorgonio Wilderness, covering 27 miles over three days, from Onyx Summit on Highway 38 to Poligue Canyon Road, in the mountains above Big Bear Lake. These new miles would connect to the section that we hiked back on Memorial Day Weekend. 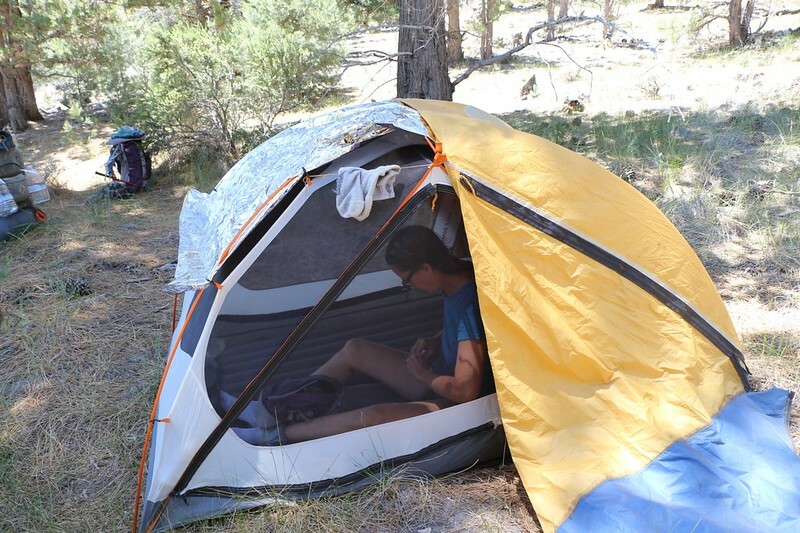 The end result would be that the two of us completed a total of 62 miles of PCT California Section C (about half of the section). Maybe next spring we’ll tackle the other parts of Section C, when the weather is cooler and the mountains are wetter. When I planned this hike, I knew that water would be the limiting factor. In fact, the only water present on the entire 27 mile section was five miles from the beginning and four miles from the end. That leaves eighteen miles of dryness. Sadly, we wanted to camp at the one-third and two-thirds spots (nine miles per day), and that scenario wasn’t looking likely. So the alternative, I figured, was to supply our own water! 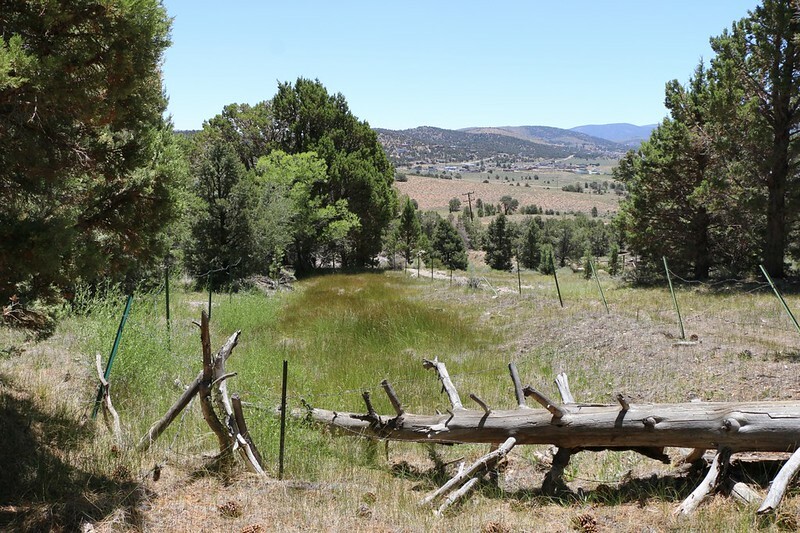 I began looking for roads that crossed the trail somewhere near those two magic positions. And I found them: One at ten miles and the other at sixteen miles. So the first day we’d have to hike a bit extra, and the second day we’d have to carry our water along with us until we found a spot a mile or three further on. And that’s what we did. It all began in the wee hours of a three-day Fourth of July weekend. We woke up just after midnight, drank some coffee, packed the car, and headed out on the long drive to Big Bear Lake from San Diego. 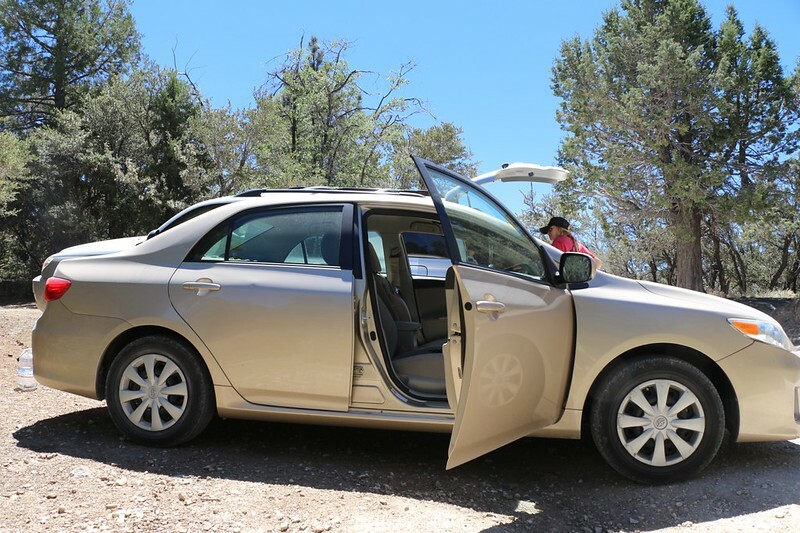 We took two cars, my son volunteering for the necessary-yet-not-glorious job of shuttling us all over the place, first to the terminus, where we left our own car, then to two different water-cache locations, and finally dropping us off at the beginning of the hike. After he saw how far we had to hike, I think that he was happy to be heading home! We donned our big packs and began to hike. 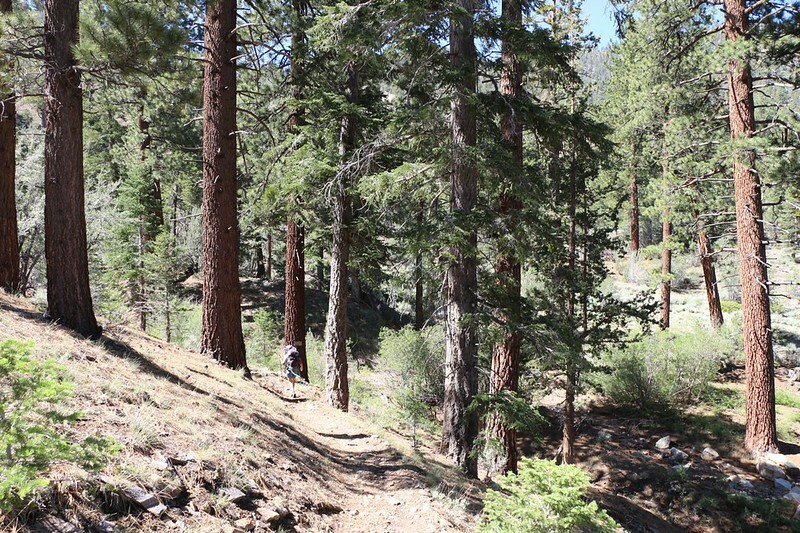 The weather was nice up at that high elevation, and there were plenty of big trees for shade. Every so often we’d get a great view when the slope below us was steep enough to let us see out over the trees. 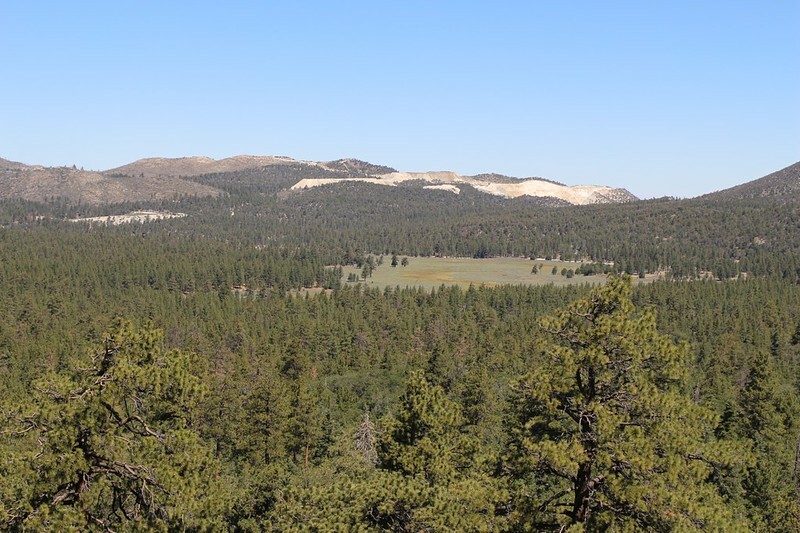 We saw San Gorgonio Mountain from the northeast, which was a new view for us, and we discovered (not surprisingly) that there was no more snow. Once upon a time, back in July 2010, we glissaded down one of those very chutes, but not this year. 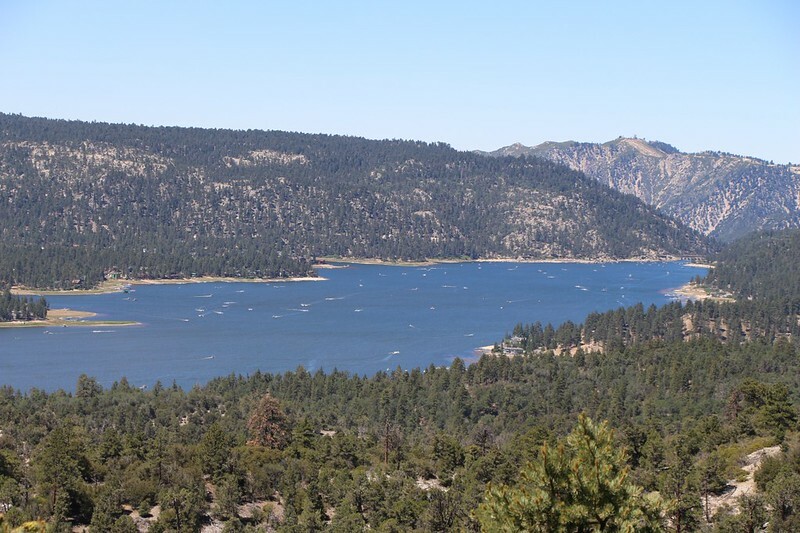 We were also able to see parts of our upcoming route, which traversed around the town of Baldwin Lake and Big Bear City, staying in the hills above the towns. MAGIC PCT Trail Angel Supply Container full of goodies! 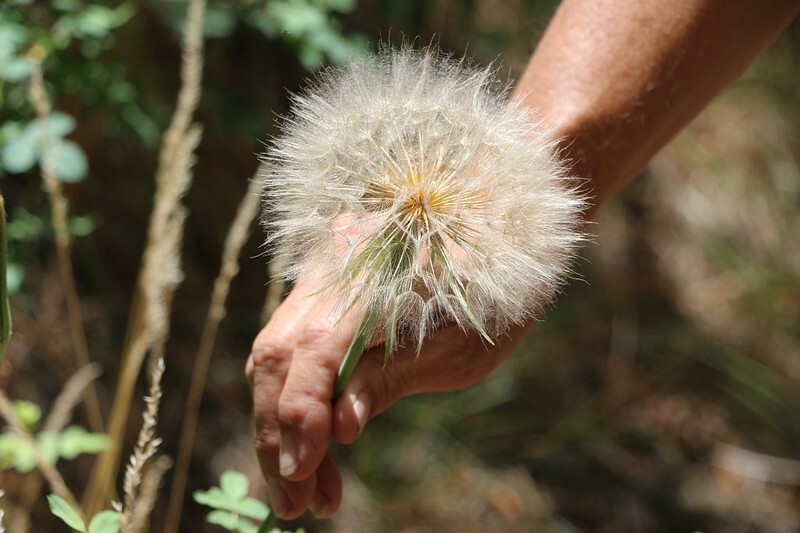 One of the most heartwarming things we’ve seen as PCT hikers is the behavior of Trail Angels. They’re typically former hikers who live in towns along the trail, and these “Angels” adopt sections and help hikers along the way. 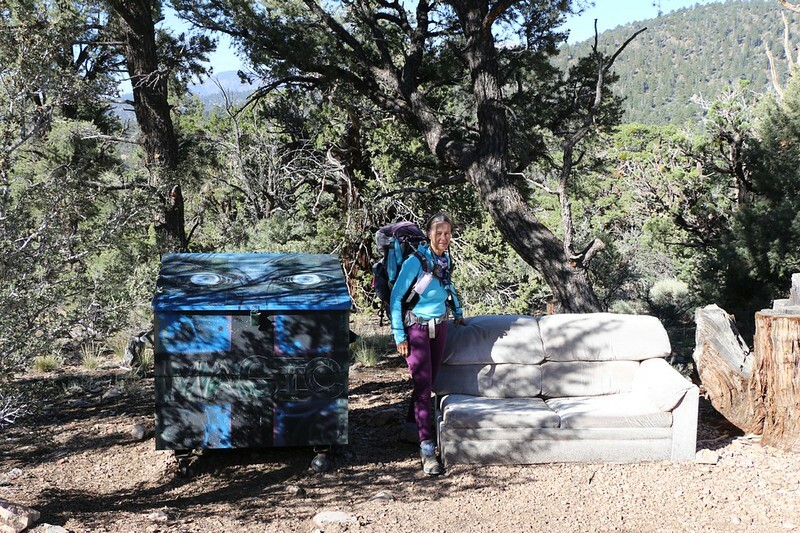 Most through-hikers are young and penniless, and they’ve scraped nearly everything they had together in order to hike this trail. Trail Angels know this, and help them out with water, supplies, rides to town, a place to stay, or a hot shower. These folks are great. 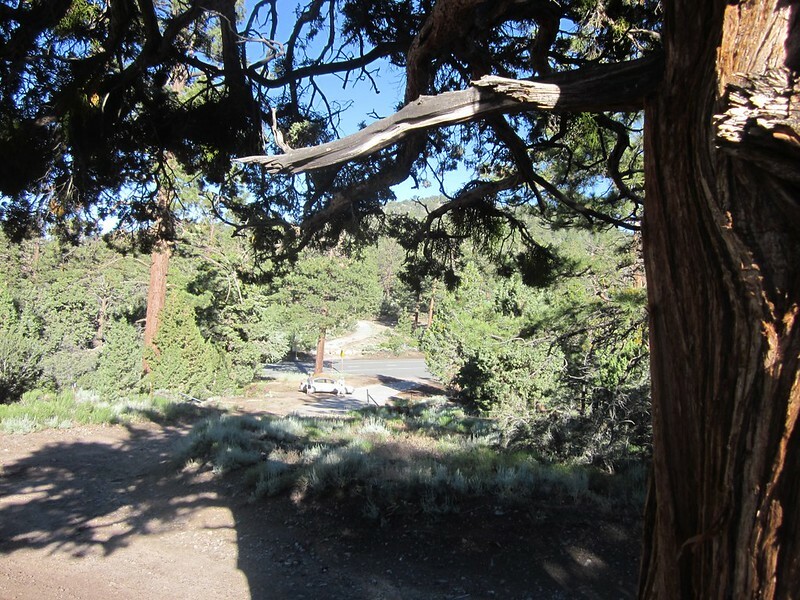 “Papa Smurf” is one of the angels in Big Bear City, and I suspect that he may be involved in the large container full of sodas and cookies and food and toiletries that we discovered not far from Onyx Summit. Thanks! And I admit that I ate one small pack of cookies, even though I’m not a through-hiker. It was just so tempting to a carb-starved hiker like myself! Thanks! Not long after that the trail began descending into the Arrestre Creek Valley. It was shady down there, although there wasn’t any water, at least not initially. Interestingly, I had read about a huge thunderhead that had dumped over two inches of rain near here the day before, and we saw plenty of signs that the brunt of it had occurred right about here. 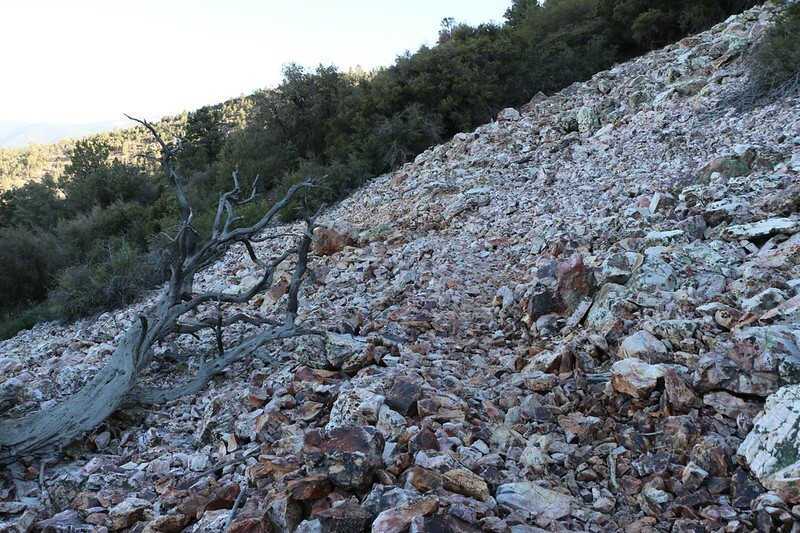 There were an excessive number of small green branches littering the trail, and also some recent debris flows of mud down into the bottom of the valley. 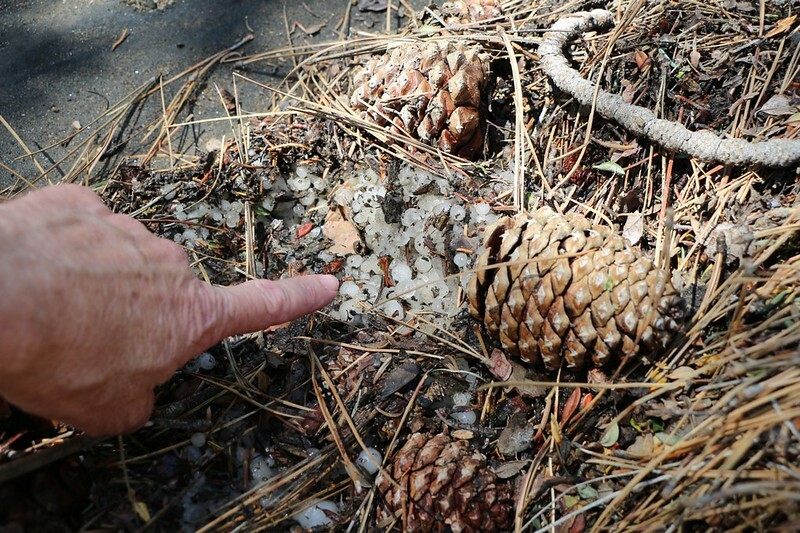 Stepping on the debris, I discovered that it was composed of hailstones and pine needles! Lots of hailstones, some of them measuring 3/4 of an inch in diameter! We were really glad that we hadn’t been here. It must have been dangerous. And probably freezing cold, as well. Vicki decided to use this bounty of ice and placed some hailstones in a bandanna, then wore it under her hat to cool off. Refreshing! 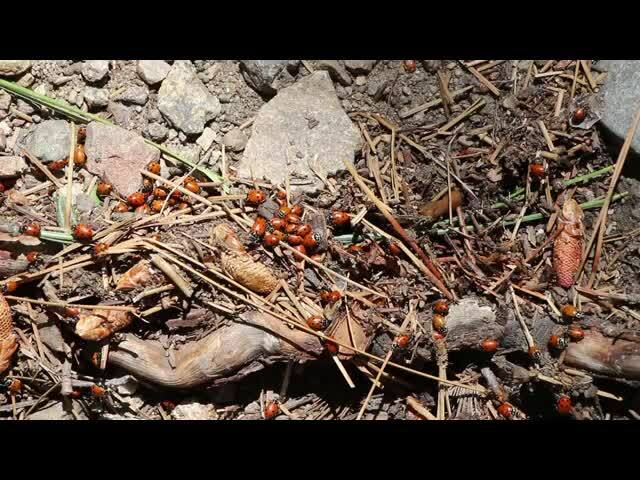 We also saw a hatch of ladybugs. They were crawling all over the trail, in such numbers that you couldn’t help but step on them. Sorry, ladybugs! There were so many that we could smell their unique odor. A rare experience, indeed. 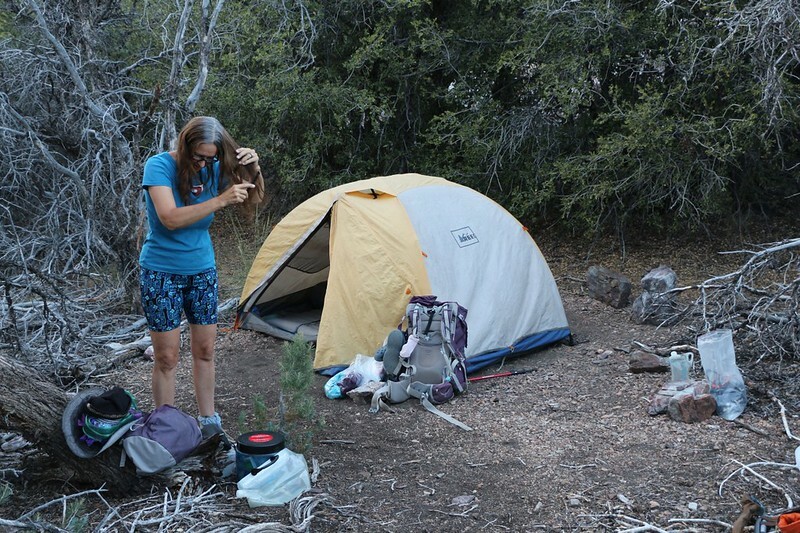 After that we checked out an official trail campsite, and there was even a trickle of water in the stream, just like the PCT Water Report said. But we didn’t need any. All in all, we really enjoyed this valley, and we were even happier when some puffy cumulus clouds began to form above us. That would mean some shade and relief from the hot sun. But we didn’t want them to turn into thunderheads. 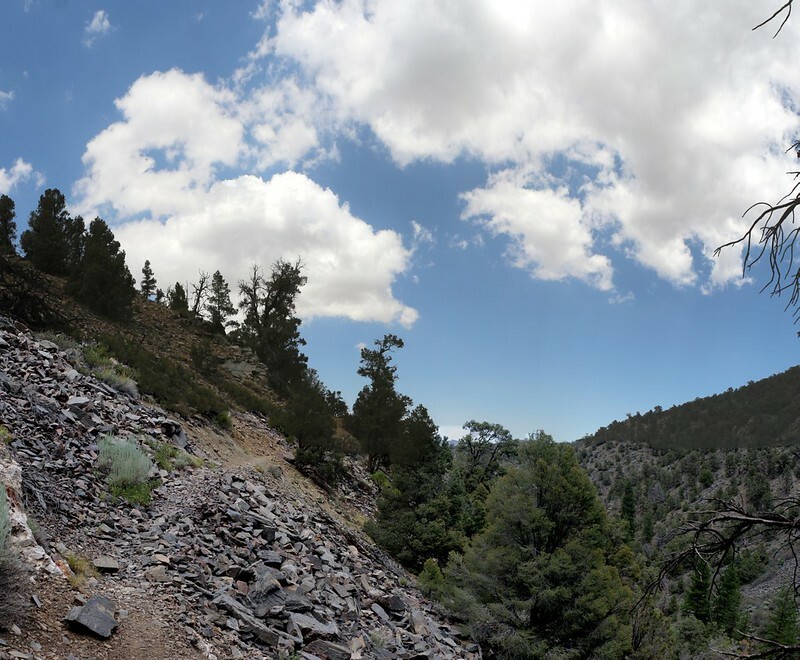 All told, we had descended nearly 2000 feet along Arrestre Creek, and the map made it obvious that if this trend continued, we’d eventually end up down below in the roasting hot Mojave Desert. Unfortunately for us, this meant that the trail had to climb out of the valley. And that necessarily meant that we had to head uphill. And it was hot. We lucked out, however, and still had some shade from a cloud, but it didn’t last all the way to the top. 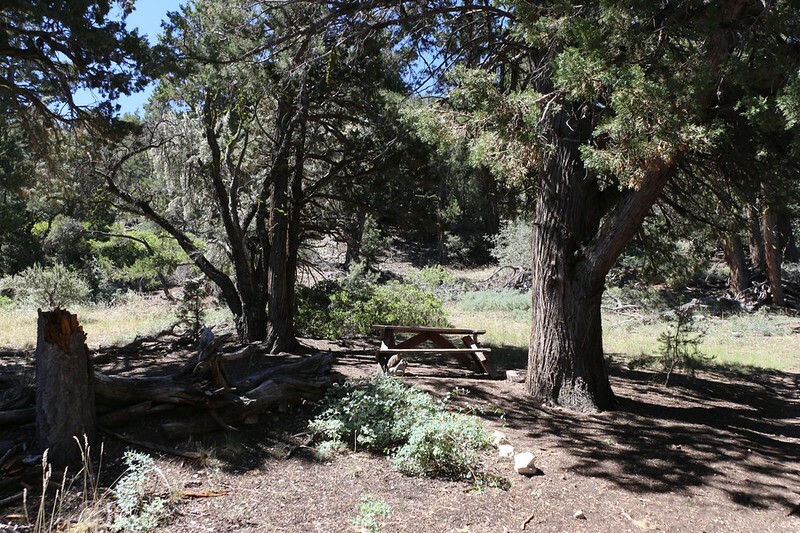 Vicki still got overheated, and we had to stop in the shade of a juniper tree for a nap, some lunch, and a chance to remove our shoes and cool our feet. Soon enough, we realized that the afternoon was getting on and we still had several miles to hike, even though the temperature hadn’t dropped very much. So we decided to tough it out and hope for a breeze once we got out of the valley. And that’s pretty much what happened. We also got some nice views of the surrounding hills. 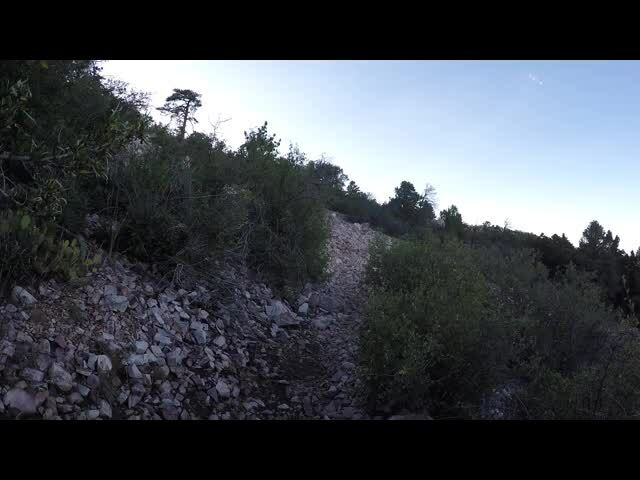 Eventually, we arrived at the final descent to Burns Canyon Road, where we’d cached our water. And we already knew that there were some nice flat places to camp right there! True, there wasn’t much of a view from camp, but we didn’t really care. It had been a very long day, what with all that driving and caching in the pre-dawn darkness, and we were happy simply setting up camp and eating some dinner. And then we crawled into the tent and got into our sleeping bag. We didn’t even wait for sunset. And we slept really well. 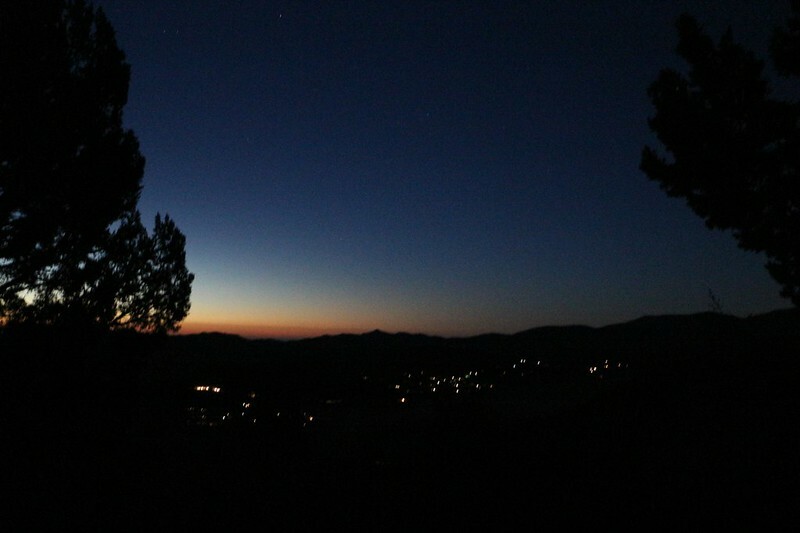 We woke at first light, knowing that it would be another warm day. We wanted to get the next short burst of uphill climbing out of the way before it got too hot. So we ate breakfast and packed our gear. 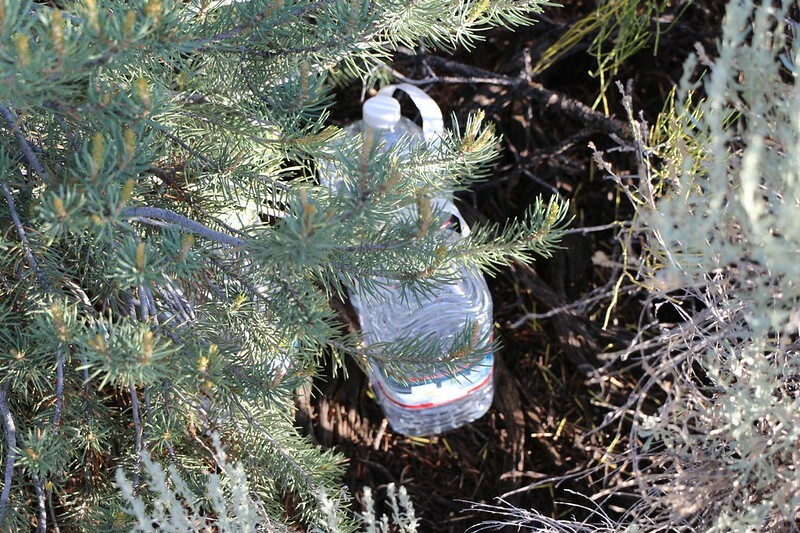 It turned out that we only needed two gallons of water, so we left an unopened gallon on the trail with a note on it stating that it was for other PCT hikers. We decided that we, too, could be Trail Angels in our own way. Indeed, there had been a cache of water back at Onyx Summit, and we found two others along the way, and all of them were close to roads that crossed the trail. The Angels have all hiked this trail, and they know what it’s like to run low on water. 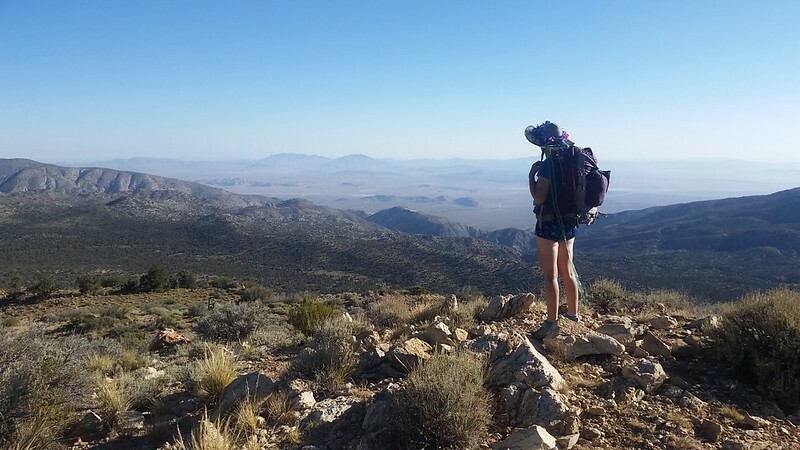 The trail climbed steadily and stayed primarily on the dry side of the Pacific Crest, so we got plenty of views down into the Mojave Desert. It looked hot down there. And the lack of trees along the trail kept us hiking from shade patch to shade patch. We only stopped in the shade, and took advantage of any breeze that offered. 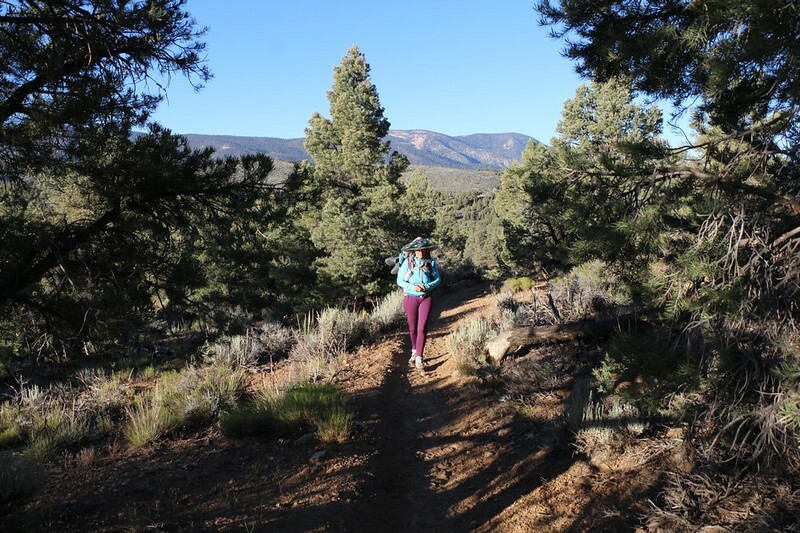 We hiked and hiked, eventually crossing Highway 18, where we laughed at a “Chains Required” sign on the side of the road, then continued onward to our second night’s water cache on Holcomb Valley Road. 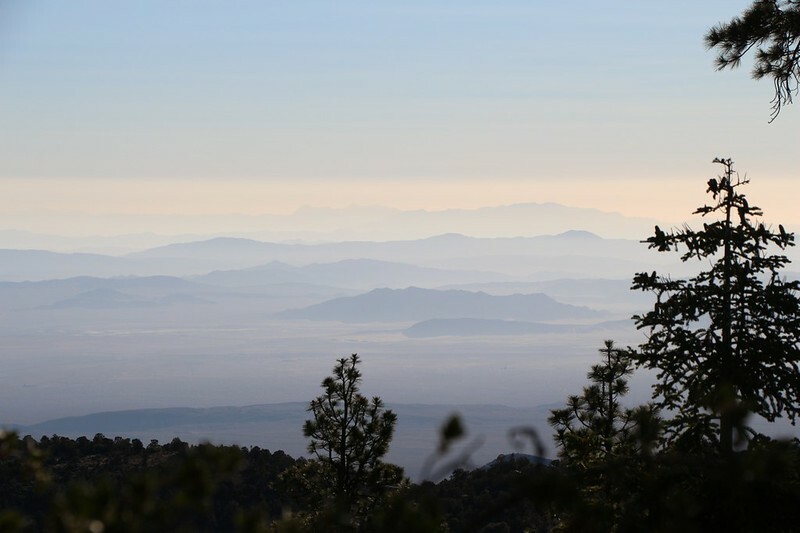 Looking out over the Mojave Desert – We were sure glad not to be roasting down there! 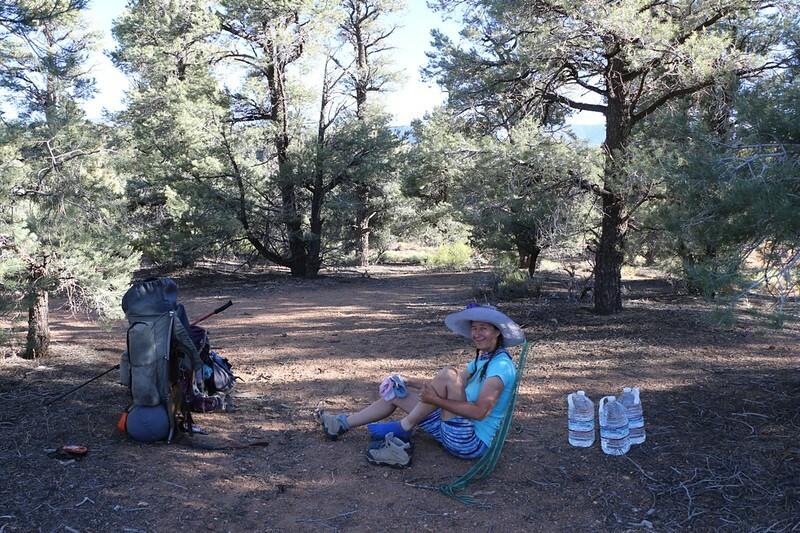 We decided to leave the water cache alone for now, and hiked onward an additional half mile to the Doble Springs Trail Camp, where we intended to have a long siesta. We would set up the tent temporarily, but only for the bug netting and shade. We decided to eat both lunch and dinner there. After dinner it would be cool enough to continue hiking. All in all, the campsite was nice enough, although we stayed on a softer grassy spot near the head of the spring. 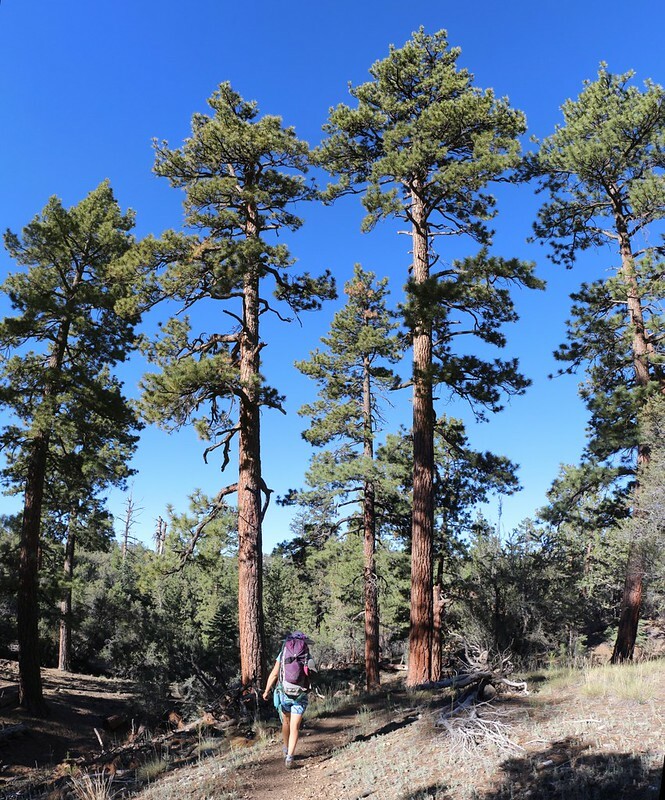 The spring had already gone dry for the summer, sadly, but we knew this from the PCT Water Report, so we didn’t expect anything. I hiked back for the water after setting up our siesta camp, and it was rather warm as it had been sitting in the sun all morning. Too bad we didn’t want hot tea! After eating lunch, we took naps and read books inside the tent, snoozing happily on our comfy air mattresses. It was a fine day for being lazy! As the afternoon drew to a close, we realized that we truly needed to get a couple more miles under our belts, so Vicki cooked dinner while I put away the tent and napping gear. Some other section hikers arrived and set up camp nearby. 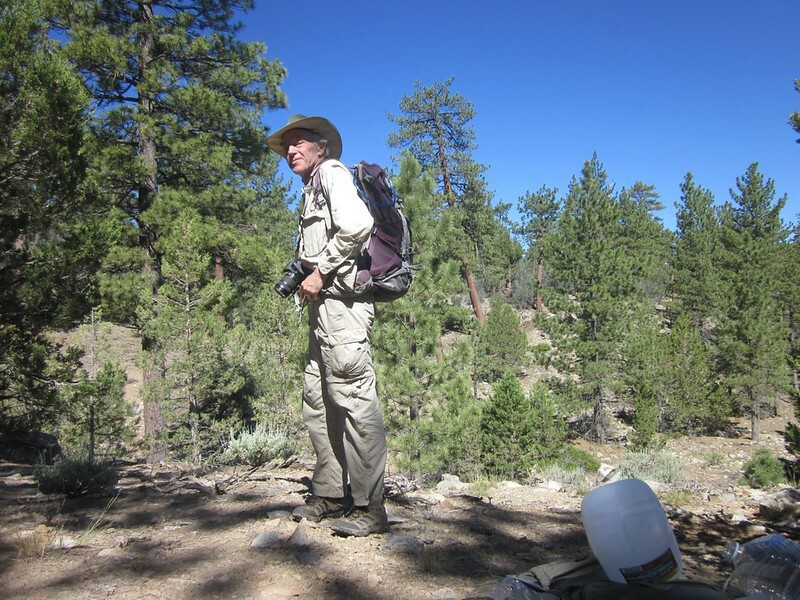 They, too, had cached water along the trail, and had started at Onyx Summit the day before, but later in the day. This camp, for them, was the end of the hike. We wished them well and hiked onward, climbing uphill on the eastern slope as the sun dropped west behind the mountain. It was great to have plenty of shade as we climbed, and the view out over the town of Baldwin Lake were excellent. Just the same, it was hot, and climbing 500 feet made it very obvious. We took plenty of rests along the way, and checked out some fun talus fields, where the loose rocks made interesting clinking sounds. Up near the top was a saddle-like area on the topographic map, and I had hoped that there would be a suitable campsite there. In fact, there were several spots, although none of them would win any beauty contests. There were too many dead trees and deadfall branches everywhere. But that didn’t matter all that much, as our siesta spot earlier had been so fine. We hiked over to a nearby viewpoint after setting up camp and watched the sun setting over the valley below us. It had been another long day on the PCT. Once again, we woke up at the crack of dawn and started getting ready. After taking a couple a pre-sunrise shots I headed back to the tent to pack things up. Vicki got the breakfast and coffee ready and we walked over to our view spot to enjoy the cool morning. We knew it would be heating up soon, and we also knew that we only had about eight more miles to go and we’d be at the car. That thought alone was enough to get us moving, as we still had to drive all the way home afterward. At first the trail stayed high, side-hilling on a north slope, giving us long views into the haze over the Mojave desert. 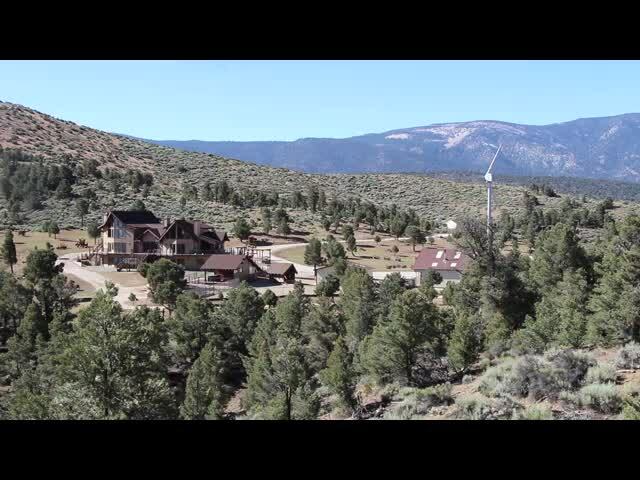 But soon enough it turned to the left and traversed some high rolling country, with big pines and open meadows. It was pretty up there. 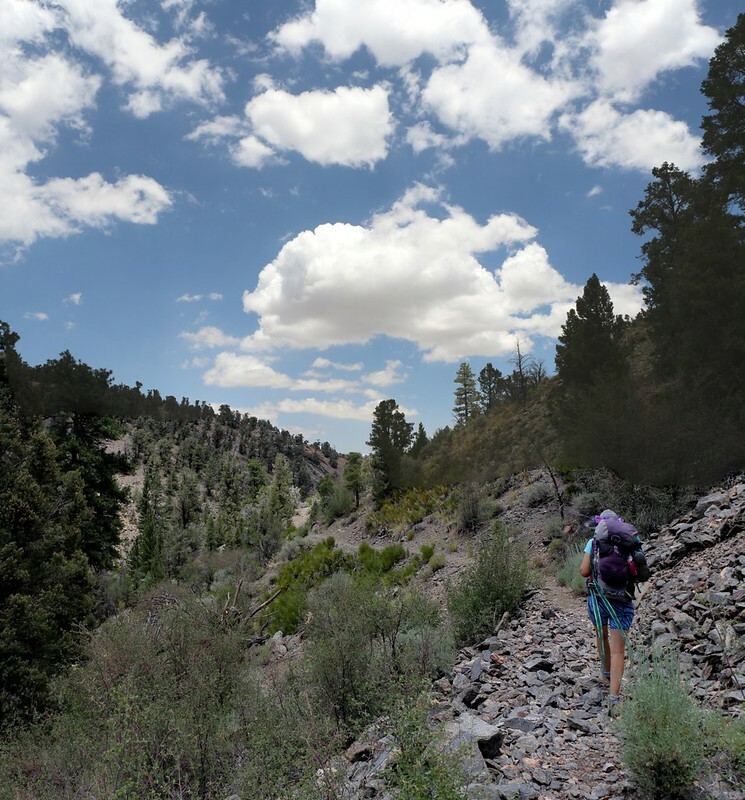 Eventually we reached the end of the plateau and began descending into Van Dusen Canyon along a dry watercourse. 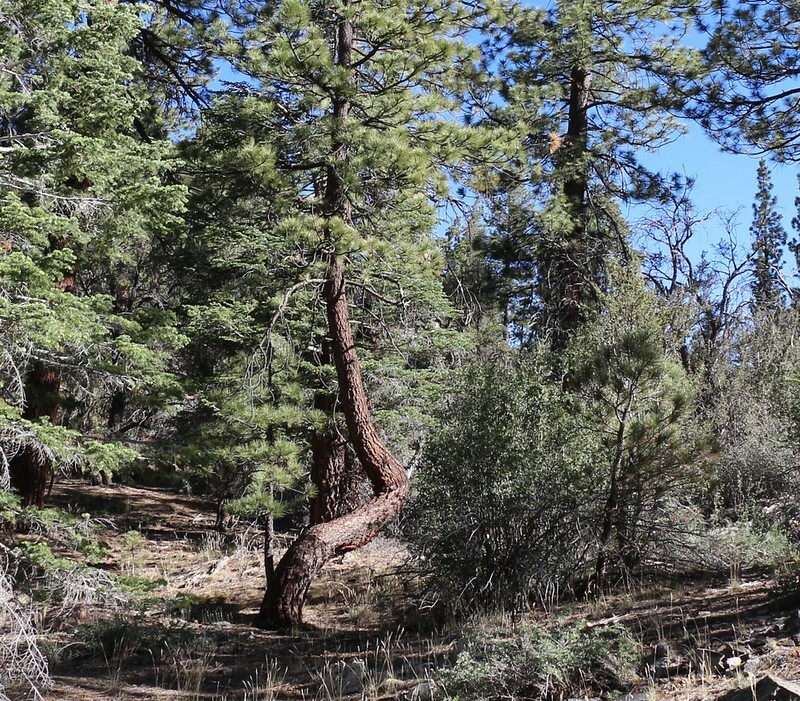 We looked up and there it was – a twerking tree! 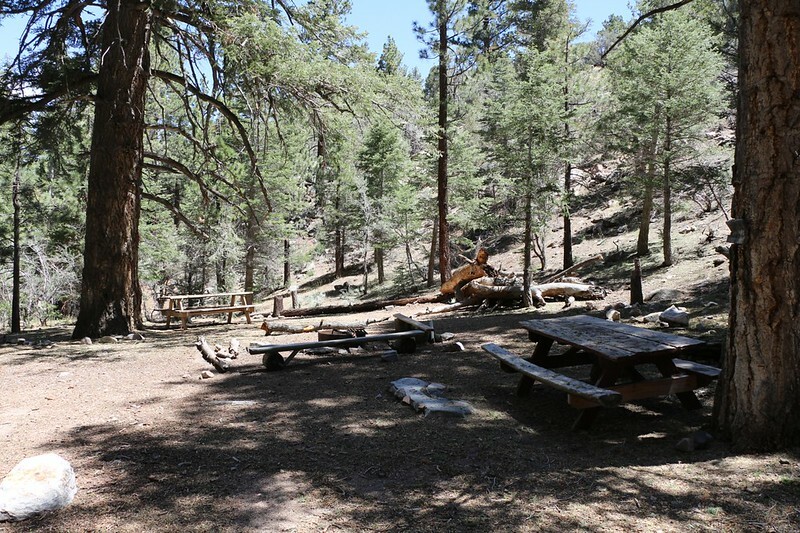 There was a dried-up stream and large campsite along the trail near Van Dusen Canyon Road. There was also a water cache left by some Trail Angels, now that July was here and the stream was dry, which was nice. We didn’t need any, but we appreciated the offer. 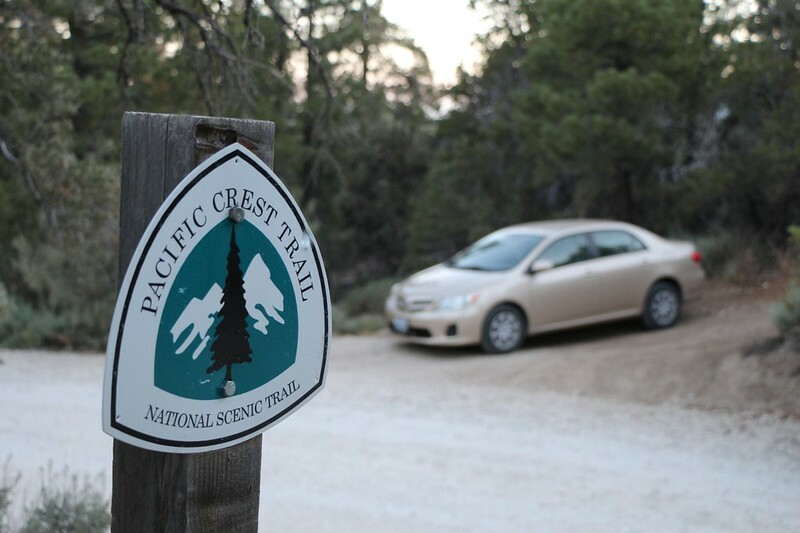 We crossed the road where a trail sign stated that our car, at Poligue Canyon Road, was 3.5 miles away. And, sadly, it was uphill from here, seeing as how we were in the bottom of a canyon. This made Vicki rather sad, but she decided to go for it anyway, even though the sun was getting hotter. And she made it for about a half mile, but I could tell she wasn’t doing very well. She was overheating, as usual. She really wanted to take a siesta. But if we took one we’d be here for hours and then we might not get home until midnight. So I proposed a compromise, which she readily accepted. We would hike back down to Van Dusen Canyon Road and find a nice spot for her to take a nap. 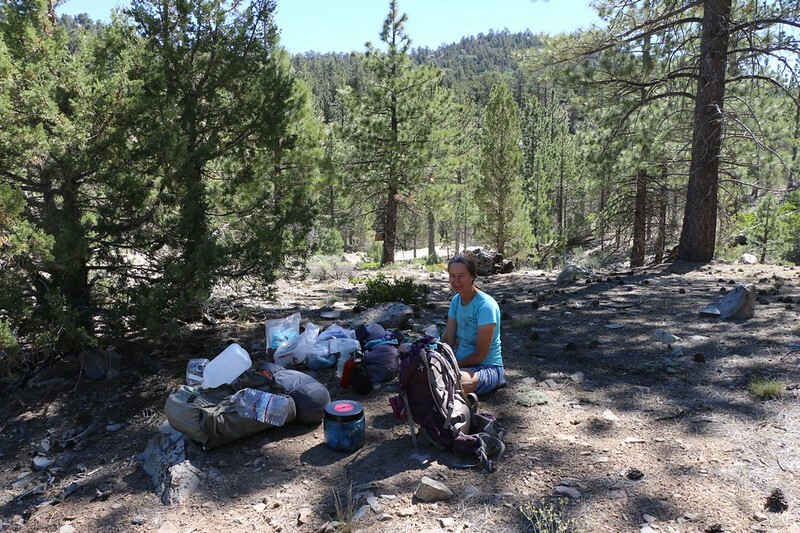 We’d leave my big heavy backpack and most of Vicki’s gear in the shade, while Vicki napped and I hiked on with only the bare essentials in Vicki’s small pack. I’d really be able to travel, even uphill, and I’d get to the car in less than two hours. I would then drive the long way around and meet her right here, where we could load up the car and head home. And that’s what we did. And those next three miles turned out to be quite lovely. I was sad that Vicki was missing out on all the excitement. 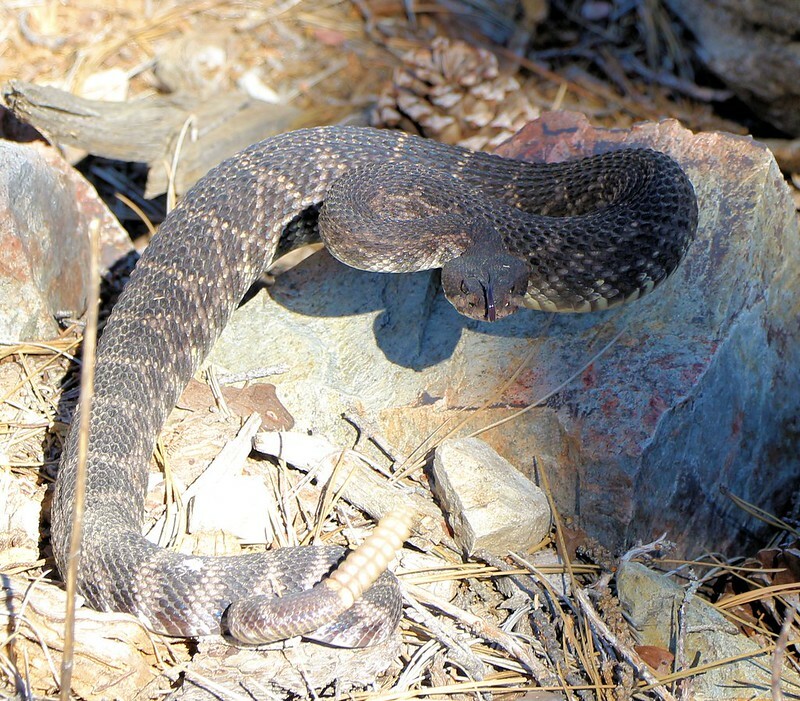 And I think that the most exciting thing of all was coming face-to-face with a big old rattlesnake! Luckily, he heard me coming before I heard him, and he managed to get off the trail. But that’s as far as he would go. He coiled himself up and set that rattle buzzing full blast as he watched me cautiously approach. Somehow, I don’t think he liked me. I kept getting closer, not further. But I had to, to get past him, as the trail was on a steep slope. Luckily, he was down below the trail, so I had the advantage of height. I angled along up the trail until I was just past him, then I stopped to take some photos. I figured that I could always run away if he went insane and attacked, which didn’t seem likely, since I was about twenty times bigger than him. I knew that as long as I didn’t threaten him or get too close that I’d be fine. And I was! 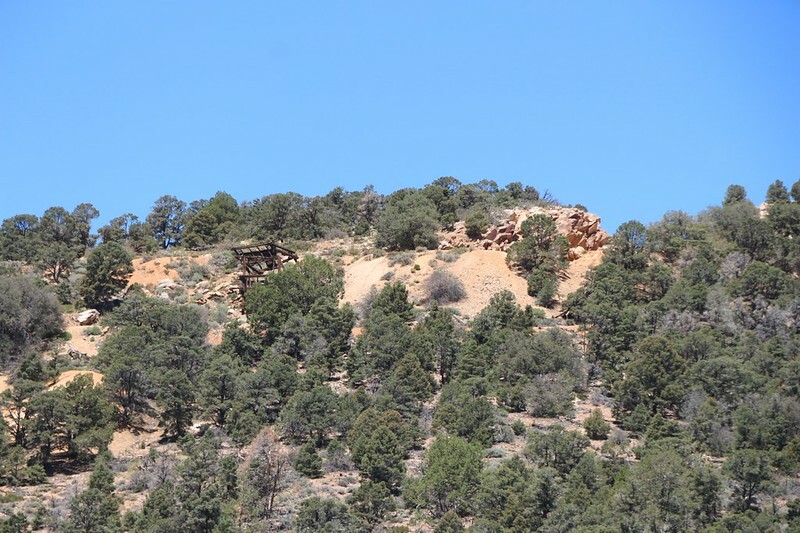 After my heart stopped pounding, I continued onward up the trail. 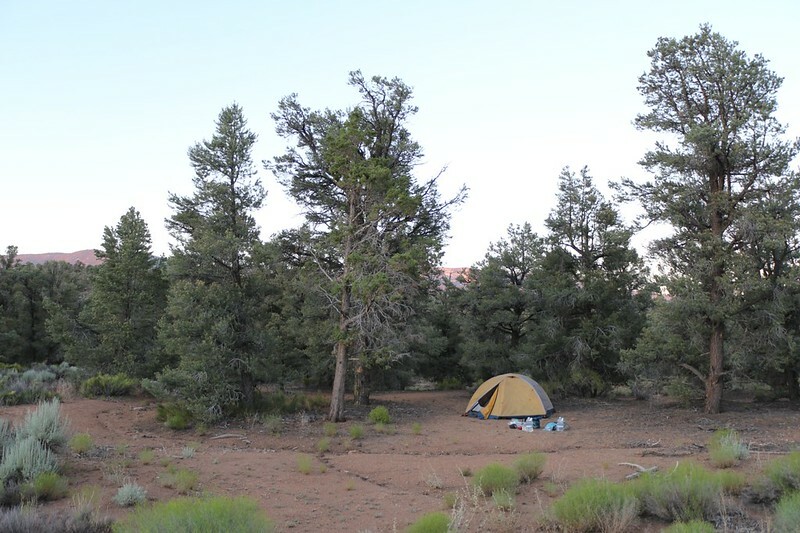 Within a mile or two I came upon a pleasant campsite on a saddle. There was no water, but someone once brought a picnic table there! Nice shade, too, If Vicki hadn’t gotten so hot we might have made it here for a nice siesta. But we didn’t, and I was a man on a mission, so I didn’t stop for more than a minute. Soon enough the trail topped out and followed along high above Holcomb Valley, and the views were quite excellent once more. And then the trail turned south and headed over the Pacific Crest. Suddenly, I received the best view of the entire hike: Big Bear Lake, with San Gorgonio Mountain beyond it, looking majestic as always. As I hiked I took countless photos and panoramas of the lake below. As I looked closer, I realized the the lake was covered in humanity! There were boats motoring everywhere, and in every direction! It was a Fourth of July Weekend in full swing down there! It was great to see so many people having a wonderful time in the mountains. The trail continued on, and eventually popped back over to the north side of the crest, and before I knew it I was at the car. I had gotten there in record time, hiking along faster than my usual brisk pace, with my long stride and little or no weight on my back. I jumped in the car and started driving down that dirt road. 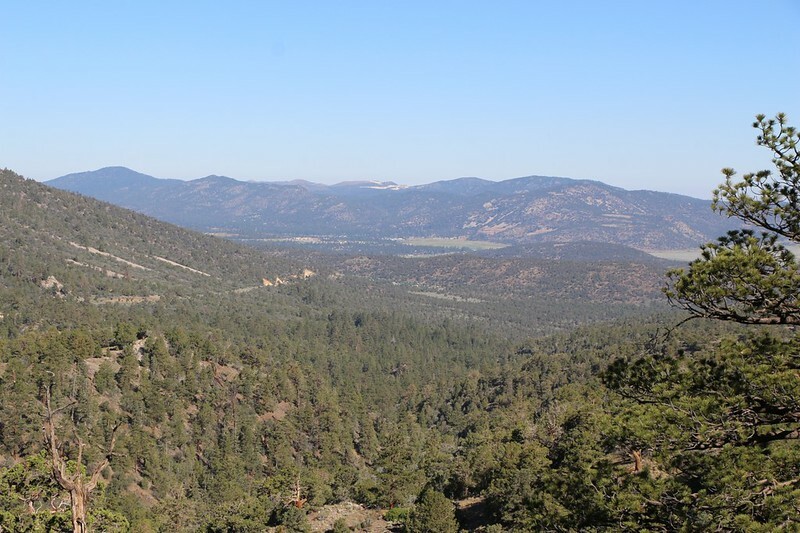 Then I had to travel a few miles on Highway 38 from the town of Fawnskin to Big Bear City, where I turned left onto yet another dirt road. 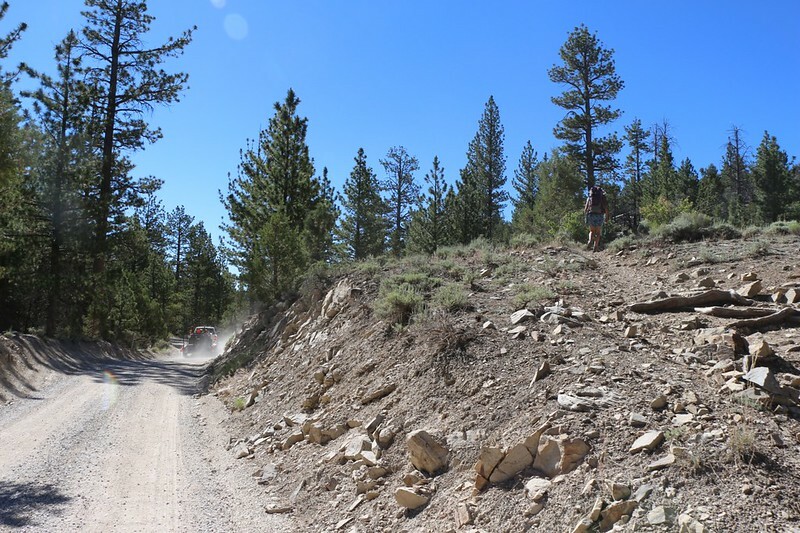 Luckily, it was in tiptop condition, and I was able to drive along above twenty miles per hour, so I made it to the PCT junction in no time at all. 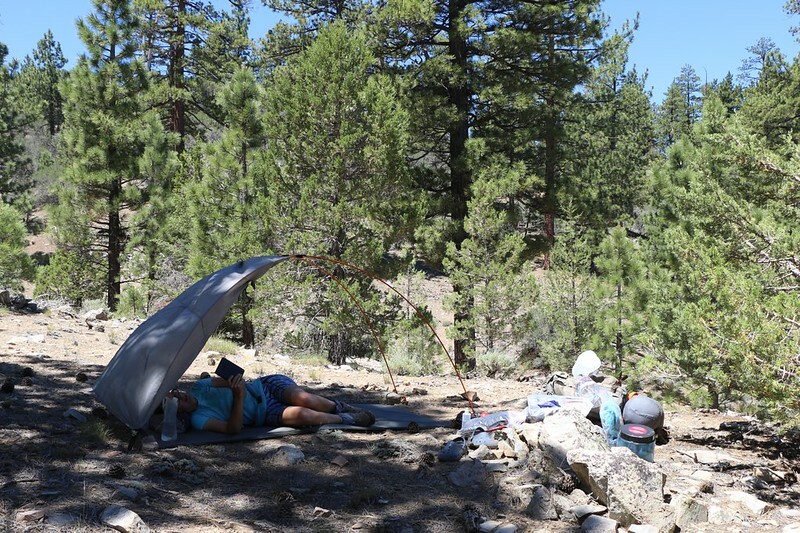 I parked the car, then hiked up to Vicki’s shady spot, and found her living in comfort, reading a book and relaxing under the partially set up tent. I lay down with her for a little while and told her about the rattlesnake, and the boating on the lake, and the madness of people everywhere along the highway. She was sad that she missed the sights along the trail but was happy that she didn’t have to suffer up that long climb in the heat. After that, we packed up all the gear and loaded it into the car. Vicki decided to drive through all those crowds of people, and I was happy to let her! It was amazing how many people were down there, and every parking space was full. We were extra glad to be heading home a bit early, as we’d be avoiding the inevitable traffic jam later on that evening, as all of those folks would be heading down the same winding, two-lane mountain road. Once back in civilization, we stopped for some food and talked about our trip. We also began thinking about the next trip: A ten-day trek in the Cascades up in Washington. And it was only a month away! 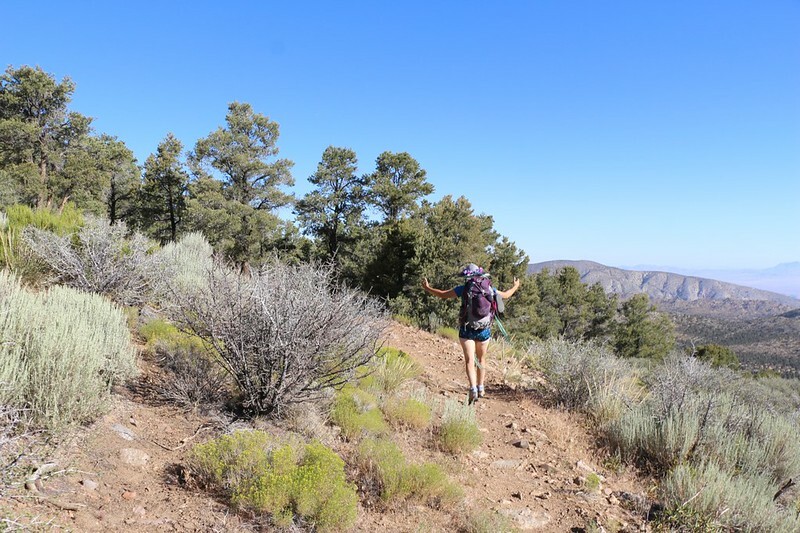 We also decided that maybe we’d continue section hiking along the PCT next spring, when there would be more water along the trail, and maybe it wouldn’t be quite so hot. That pretty much kept us occupied the entire way back to San Diego. Hiking, and making plans for more hiking: I do a lot of that these days! To check out even more photos and videos be sure to view my Flickr Album Page. For an interactive topographic map please check out my CalTopo Page.